Imagine waking up to the cool Banaue morning with a view of the rice terraces and tree-covered mountains just outside your window. 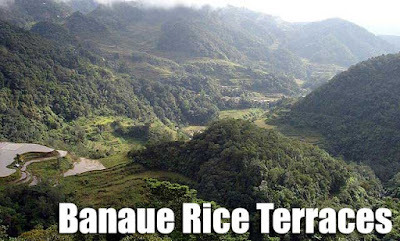 That's what I experienced at the Banaue Hotel for the past few days, with rooms, function rooms and a restaurant that provides panoramic views of the rice terraces. That's one cluster of terraces in the Banaue poblacion which is still free from eyesores and other unsightly structures. It was our last day in Banaue and I'll definitely miss the cool mountain air and the great views. 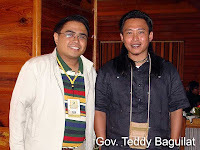 Before leaving for Manila, we listened to Ifugao Governor Teddy Baguilat talk about the challenges they have been facing in the preservation of the rice terraces and possible solutions to these problems. It's indeed very difficult to push for the preservation of these terraces when almost every young Ifugao dreams of making it big in the city, when G.I. sheets and hollow blocks become a status symbol. But there is definitely hope since the community realizes now that they are custodians of a legacy to the world. 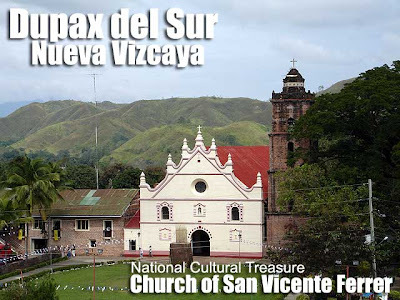 On our way back to Manila (I was asleep again for most of the trip), we made one last stopover at Dupax del Sur to check out the San Vicente Ferrer Church which is a National Cultural Treasure. We had lunch there too. Anyway, it's back to school for me. Omg! Wonderful details! I'm happy to see that they were able to preserve this. What a wonderful vista! So glad the grass plaza is still there and hasn't been cemented over. 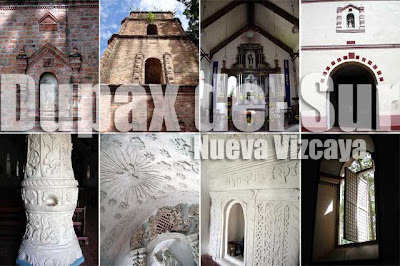 This was recently restored by the National Museum funded by the US Ambassador's Fund. The top photo was taken from the rooftop of the new building of the municipal government. The only thing I didn't like was that hideous looking belen they placed in front of the church. It's a good thing that they got rid of the heavy layer of white paint. I wonder if the baptistery and pillars was all white during the Spanish period. Yeah, our architectural heritage paid a heavy price from that strategy of total destruction. I'd imagine that its either bare or polychromed originally. But, just to see it still existing and haven't been gold leafed to death (hahaha) makes me happey. Yup, good there was no overload of gold leaf. Hehe! Brod, isn't the Bayombong facade covered by new bricks? I don't remember seeing Bambang and Bagabag though. I am not sure what victoriarancheta means when she states Americans are responsible for a lot of destruction during WWII. Maybe she would feel better about life in the Philippines if she were now speaking Japanese? Has history now been re written to make America the "bad guy"?